The first guide in our Complete Crafty Gift Guides for Everyone Series is geared toward young children; whether they are too young for standard art activities, have allergies prohibiting conventional art supplies, or maybe you’re just looking for low(er) mess or travel friendly gifts to feed the creative mind. These aren't your typical arts activities, but they tap into the creative mind and encourage lots of open ended play. And one of the things I love most about imaginative gifts is their longevity! We have a great many of these toys that are still adored by my 6 year old, and, of course, bring much joy to my 17 month old. My favorite items are the ones they can play together! (Is there anything sweeter?) I have a LOT of product suggestions, and there is no way I can cover them all here, so be sure to check out the full list too! 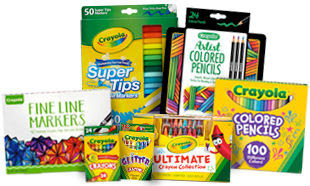 If you are looking for more conventional arts & crafts gifts for young ones (crayons, markers, etc), I have added many gift ideas to a separate list that you can find at the bottom of this article. Melissa and Doug's Water Wows have almost single-handedly provided peace and entertainment for our family for over 5 years. From car rides to restaurants, doctor appointments to weddings, and everything in between, I RARELY leave home without these reusable, resilient gems. They cover a range of skill sets and creative exercises that my kids have loved pretty much from 1.5 to 6+. We own every. single. one... or so I thought! But kids never stop, and neither does Melissa & Doug. They have come out with awesome NEW Water Wows for older kids, and I am STOKED. 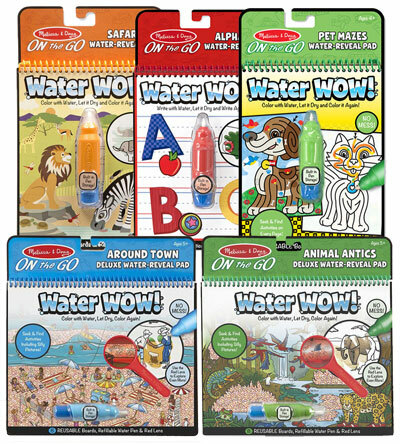 These new products feature animal mismatch flip books, connect the dots, mazes, and deluxe versions complete with a red lens for a whole new level of play! This is in addition to their ever popular writing pads for letters and numbers. Are they all in my cart now? Yeeeep. And you can get carried away browsing the complete collection of Water Wows here. While we are talking about writing pads, I want to take a minute to talk about light pads. First, the Boogie Board LCD eWriter. It may seem simple, but well constructed and a literal blank slate for hours of fun. We take turns drawing pictures, playing charades, building graphic stories, playing tic tac toe, practicing letters, writing words, and more! The boogie board takes up very little space and is great for travel. I even used the included magnets to attach one to my fridge as a mess free alternative to dry erase. They have pads with a larger stylus for little ones, the pad pictured here, and even a newer version with replaceable batteries. FWIW, we have had the pictured version for years and the battery is still going. 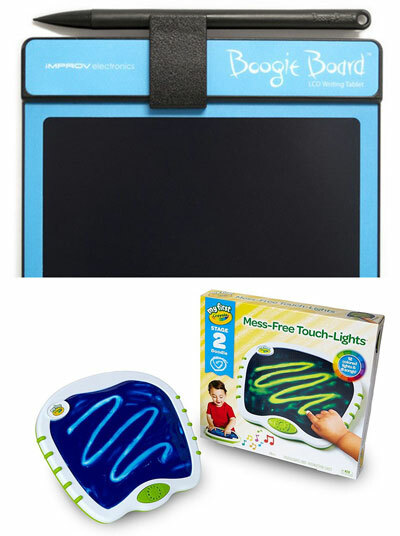 Also worth mentioning, Boogie Board also offers tracing pads both for younger and older kids, and Crayola offers this awesome My First Touch Lights Pad for the tiniest of toddlers. Magnets. If you had told me that a lot of my child’s early creative play would be facilities by magnets, I’m not sure I would have believed you. But it’s true! From magnet dolls to magnetic activity boards and magnetic blocks, there is so much open-ended play to be found! And sure, magnets aren’t exactly what you think of when it comes to crafting, but there is a lot of imagination going into this creative play and it's an especially wonderful tool when you’re navigating food allergies and limited on more conventional supplies. 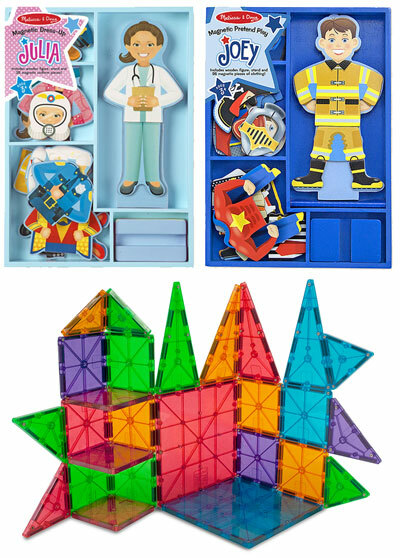 When considering magnetic construction, there are a LOT of options available (Magnatiles, Magformers, Tegu, just to name a few), and they are ALL fun. But my personal favorite are the Magnatiles. Not only are these great from a construction standpoint, they come in a lot of different designs (including glow in the dark! ), and their translucent colors are perfect for incorporating into light tables and light play. We have one large box of them and have gotten so much mileage for both kids. It's easily one of those toys that you want to buy more of just for yourself. 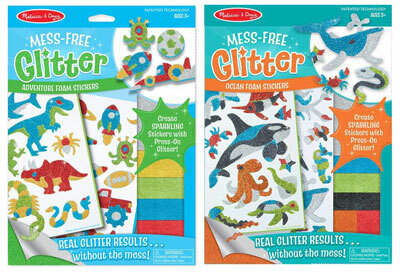 Mess Free Glitter. I know you just reached up to slap me across the face for even saying it, but IT IS A REAL THING, so stand down! My daughter has a blast designing these stickers. She uses them to decorate art projects, cards, gifts, and, you know, our Kleenex boxes. The Christmas ones are a fun holiday activity that they can then use to put an extra special touch on presents. Pair it with some kraft wrapping paper and BAM! personalized DIY gift wrap. 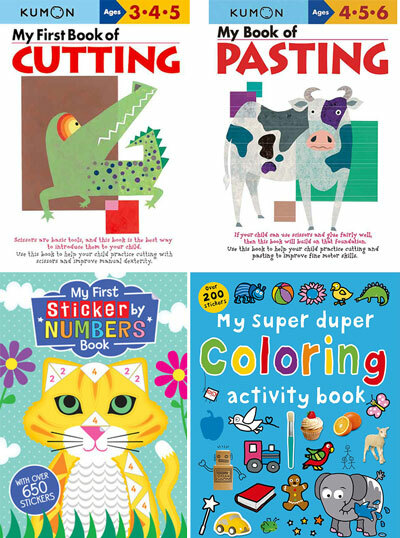 When your child is ready for some beginning level crafting, these books are the perfect way to start developing basic skills such as cutting, pasting, tracing, taping and more! The Kumon Let’s Cut Paper Series was my daughter’s all time favorite with lots of fun designs and simple activities that are perfect for self confidence building. She was SO proud of herself and it really sparked endless creativity. The First Steps Series features various difficulty levels for each skill set (cutting, pasting, tracing, drawing, etc) so they can level up and find new ways to use theirs crafting tools. When they are ready to focus on placement and precision, these first sticker books are a lot of fun. The My First Stickers by Numbers Book is solely sticker matching and making pictures, whereas My Super Duper Coloring Activity Book has coloring pages with one or two stickers to be found and matched up. These are all great skills they can start implementing with any kind of crafts. You’re laying the foundation of all future crafting here! You can find all these kits, everything else in this article with many more varieties and themes, and SO MANY MORE gift ideas (lacing beads, shrinky dinks, jewelry kits, sticker pads, terrariums, and more) by clicking the FULL Kids & Allergy Friendly List on Amazon below! 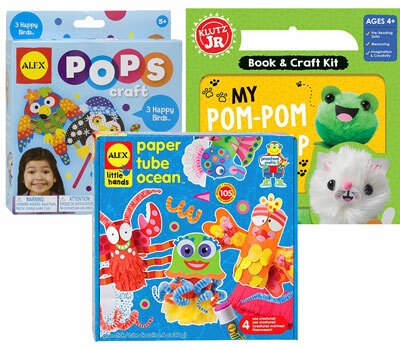 If you’re looking for gift ideas incorporating the more conventional arts and crafts supplies (crayons, markers, paints, etc) for younger children, pop on over to our Kids Conventional Arts and Crafty Kits and Gifts Idea List instead! 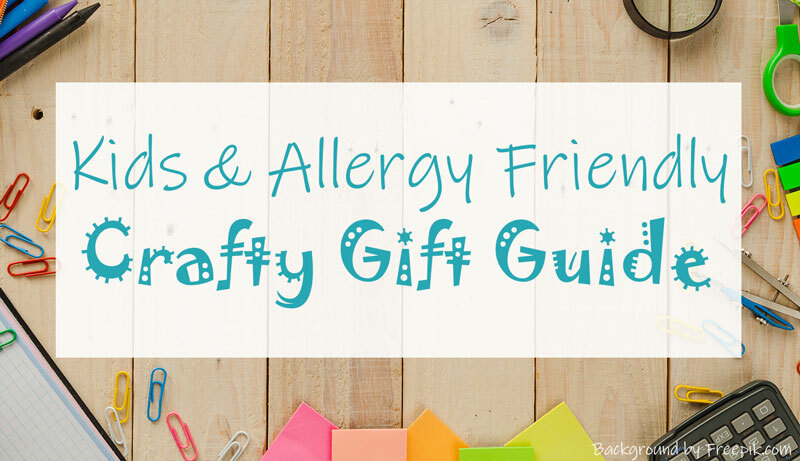 And don’t forget to visit our Tweens and Teens Gift Guide for those kids who are ready for something a little more complex--there are lots of allergy friendly gift ideas on this list too! Links included above are affiliate links and may support DFWCS at no additional cost to you. DFWCS participates in the Amazon affiliate program, but DFWCS is in no way associated with Amazon or the items above. The opinions stated above are my own, and I have not received any sponsorship or free products from the aforementioned manufacturers.